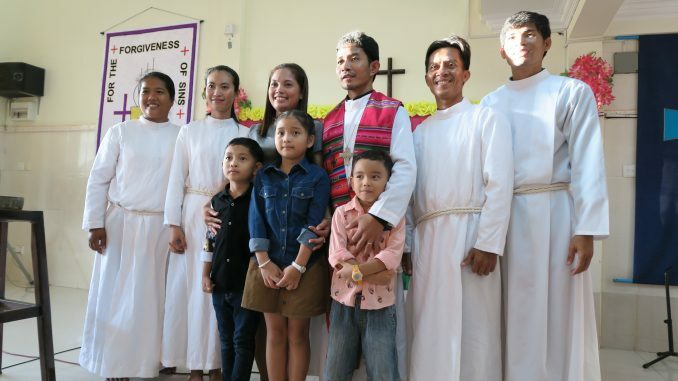 After Lutheran World Mission’s seven years walk with the Lutheran Church in Cambodia, the Khmer Church has come to point that a Khmer clergy minister would be officially ordained to take the lead of ministries of the Sacraments and the Word, Rev Daniel Orn, by the grace of God, was chosen to be the candidate. Rev Daniel successfully completed his theological studies in Phnom Penh Bible School and graduated last July 2016, juggling between his 4-year full time study, serving at City Church and parenting with his wife, Sis Heng Sreypov to three wonderful children Naomi, David and Christian. From July-Oct 2017 he was sent to Australia with support of Mission International, Lutheran Church of Australia, to take up intensive courses on Lutheranism at the Australian Lutheran College. In 2017 he was also sent to Germany to for a study trip on Lutheran studies with the blessing from Mission One World, Evangelical Lutheran Church in Bavaria that especially focus on Reformation 500 Years – how Catechisms applying in today’s contexts and to visit various Luther’s sites. 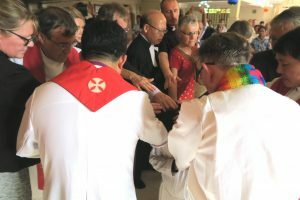 All these studies had been part of the ordination plan initiated by the Lutheran Church in Singapore through the leadership of Bishop Terry Kee. Locally for the past years, Rev. Daniel had been trained and guided by various LCS pastors, ELCB’s missionary Rev. Wolfgang Grieninger and ELCA’s missionary representative, Rev. Dr. Philip Baker in understanding Lutheran’s theology to fine-tune and better understand Lutheran doctrine on worship, ministerial skills and the ministry of Holy Sacraments and Holy Word. After nearly to six months of intensive preparation that Rev.Daniel Orn had undergone, in April 2017 he came to Singapore to go through the interview by the LCS Ordination Committee panel, which took place at the LCS’s Head Office located at Jurong Christian Church. By the grace of God, Rev Daniel Orn passed the interview and was thus recommended for ordination. One of the obvious challenge that Rev Daniel saw ahead was how to balance time between ministering the Word and Sacraments versus the social ministry in LCC and spiritual growth of LCC pastoral staff which will eventually bring spiritual growth of the congregation they are shepherding in. Despite of all those concerns, he felt blessed to be surrounded by well trained, passionate staff to share those burden, and most importantly he assured that God will be LCC guide. Rev Daniel strongly believed that God’s mission is holistic; as what Jesus did on earth, it will be his focus to bring improvement as he leads LCC forward. Rev Daniel shared that one of the dreams he has had since stepped into the ministry of God with the Lutheran Church in Cambodia is to serve his people and equip more members and staff to take up leadership roles in LCC for ministry of the Word and Sacraments and to be an influence to the community and society. On top of this, he want to see LCC could someday be more self-sustaining in finance, and especially in effectiveness and quality of delivering the teaching of the Word of God and diaconal services through the church and society with sound doctrine and accountability.